After The Burger Shop, I’ve decided to try a burger a week for the month of March. 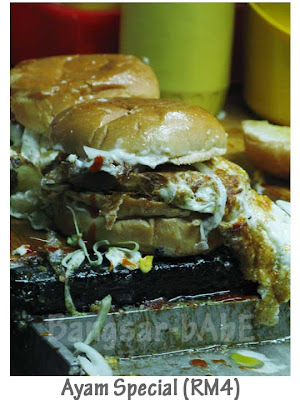 Last week, rif decided we would go all the way to Ampang for the ultimate, mind-blowing, OM Burger. The pakcik has been running this stall at the same spot in Ampang Jaya (in front of 7-11) for 24 years. The stall is older than me! @[email protected] He opens as early as 8pm till 5am daily. At 11.30pm, there were quite a few people waiting for their dose of greasy goodness. So I waited…for half an hour. 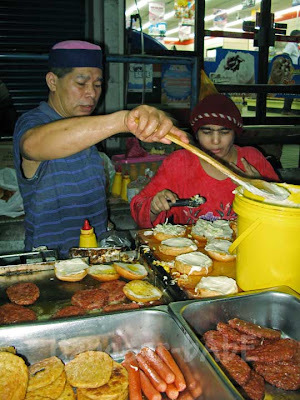 Within that time, pakcik spoke to me about his burgers. He uses quality ingredients, especially the butter and mayonnaise. One of the key factors to making a damn good burger. He uses Kraft cheese for his burgers and makes an average of 250–300 burgers a day. For those who are curious, OM stands for uncle in Javanese – according to pakcik. Jeen was full from dinner, so she had a burger ayam. rif and I ate big – 2 Ayam Special and 1 Hotdog Special to share (for supper mind you!). Halfway waiting, more people came and ordered. Clearly, this is one highly sought after burger. My Ayam Special was deliciously sloppy. Greasy and oozing with juices, cheese, mayonnaise and chili sauce, I was in burger heaven. The hotdog was equally as good (pardon the bad picture, I took it in the midst of darkness). I had trouble taking a bite without everything smearing at the sides on my mouth, and nose! It’s best not to wear white. =P If you’re a Ramly burger fan, go try the OM Burger. I’ve been eating this for almost 6 years. And rif has been eating this way longer than I have – more than 10 years if I’m not mistaken! Verdict: By far THE BEST BURGER I’ve had. the “look” is not very appealing but, I am sure it taste good, as the ingredients he used are so generous…. very very very calorific and yummy! foodbin – Very artery clogging! I can’t get enough of this! Greased and plumped it with lots of lettuce, tomatoes and egg for good Ramly burgers! omg plz gime that anytime! Yeah..I’ll take that over any fast food burgers! thats one messy burger that is stirring up my noisy stomach just b4 i sleep!!!! argh! i want one!! 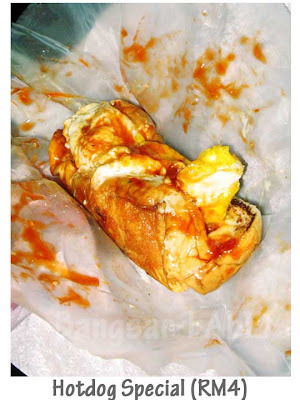 too bad im like a blind bat in ampang..
walao….. burger wor….. i live burger one……..
any number to call to deliver to Penang a?…. rif – yup yup yup! KL warung burger are really trying hard to outdo each other eh? wonder if Ipoh has any of those. 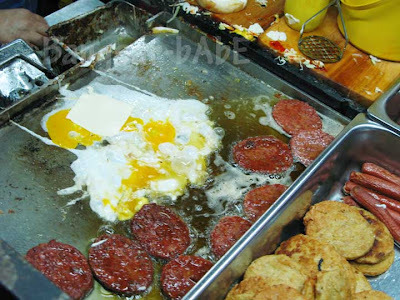 i havent tasted roadside stall Ramli burgers since …. student days I think. 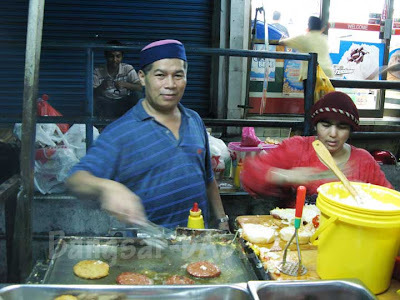 Yeap…Ramly burgers are every competitive in KL. 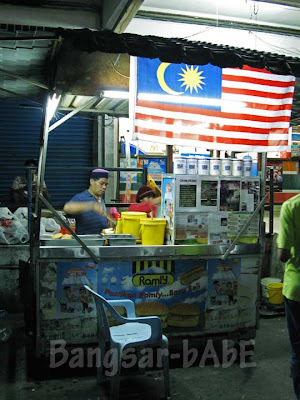 I’m sure Ipoh has Ramly burgers…even kampungs like Sitiawan got Ramly! I know where I’m going on my next holiday! These look insanely good. A bit on the unhealthy side, maybe, but who cares! My mouth is already trembling with anticipation. Great photos! Insanely unhealthy, but oh-so-divine! You should have seen the amount of butter he used. My eyes nearly popped out!! 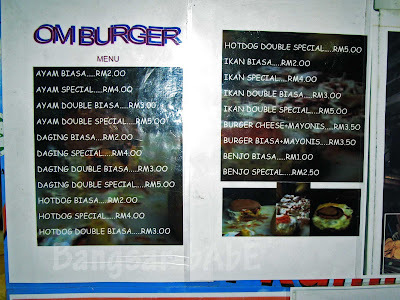 Its quite amazing that Malays have fallen head over heels with Americanised Burgers ! Ramly singlehandedly gave the kids a little business to start with and now many Malay youngsters ( under 10 )think burger is Malay cuisine ! 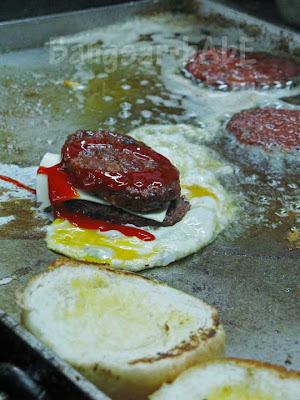 But yes , many Malaysians think our roadside burger is better than the clinical offerings from McKentKingWend , yes ? ohhh my god.. so this was wat my frens was warning me abt! SUPER GREASY! I didnt believe it till i saw ur pics.. my my my..
Hiya there! Been haunting your space for a while but never said anything before 🙂 Have to say, despite living less than 5 minutes away from this OM Burger, have never had an inclination to try. Just realised that I haven't seen a review on another Ampang eating establishment – Nong and Jimmy's. Given your love of seafood, I would be v surprised if you haven't been (I hope I overlooked it!) If you haven't, let me know and I'd be more than happy to introduce you to their Tomyam and BBQed seafood! waa… so sedapp!!! i wanna try lah! I’ve tried couple time before..maybe i’m not so into burger i think or its me the problem one?.. but every time people said the place its the best burger they ever had and right now u reading u’r blog, make me want to buy again to know what make people like the burger so much..
Bangsar Babe – Is the address that you given is correct? Is it under Lorong Kolam Air Lama 1 ? Cause according to the GPS is Lorong Kerja Ayer Lama, Ukay Heights. Bangsar Babe-Sorry for question you that question? If I ask anything wrong, please forgive me.